I have finally learned not to take myself too seriously. The work on this site is the embodiment of that philosophy. Most of it is production work. It is meant to be the fun side of what I do. Like all of us, there is an other side that comes with other work. If the work you see here doesn't seem to be what you remember my work to be, then try the page titled "alter ego" . Most of the work here is, in a way, my sketchbook. The stuff I see every day. The stuff and the places that I love. It's the practice of me doing what I love to do every day. Thanks to people all over the world who collect from one or the other of my "selves" I feel lucky and grateful that I get to do something so phenominally interesting for a living. For those that are into the details, I recieved a bachelor of fine art degree more than a couple of decades ago. Now almost as long ago, I got a masters degree in social work. The seemingly unrelated paths criss cross somewhere I guess and have led me back to where I began. I make art in its various forms from cool or funny things I see every day. Check out both sites. Write me if you like. The work on this site is representative of much of what I am doing now. 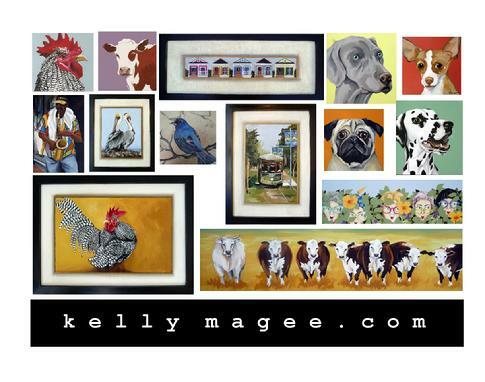 If you are interested in buying work, would like a wholesale price list, or have any questions, you may contact me by email at artistkellymagee@mail.com, or by calling 504-975-2010.